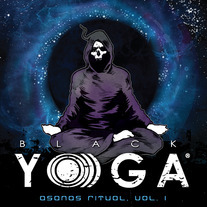 Review: "Black Yo)))ga: Asanas Ritual, Vol. 1" - Sea of Tranquility - The Web Destination for Progressive Music! I used to work out with a group of friends that trusted me to make some of the musical decisions as we lifted weights, jumped rope, and stretched. During the actual training, I usually chose classic rock or heavy metal but for the stretching sessions, I usually put on something by Om. It was fun to stretch to the sounds of that terrific band and the eastern vibe didn't hurt things, either. Everyone felt like we were ending our workout with something a little different, something that almost had a yoga-like vibe to it. This album caught my attention when it came out because it struck me as a good option for a stretching session or, indeed, for a yoga class. I know that there was quite a bit of publicity surrounding this album and that some listeners may even be skeptical that this is little more than a cash grab that takes advantage of metal fans. I understand that kind of skepticism, but I don't think it's warranted here. The music on this album is pretty much what it promises to be, a new way of thinking about yoga in light of extreme metal aesthetics and attitudes. And yes, it's also a pretty cool musical accompaniment to a yoga session while also being a reasonably good exercise in black ambient music that sounds pretty good on its own. I do practice yoga, but I usually do so with videos and really don't want the music to compete with the instructions. However, I do listen to this album, when I'm writing, reading, or working around the house or office. Don't get me wrong; this isn't just some lame easy listening background album. It's actually relatively interesting, an often riveting attempt to do something new with dark ambience that also has the practical value of fading into the background as needed. I enjoyed it and look forward to more from the Black Yo)))ga gang. If you're curious, try "The Dark Places in Our Lives" and see where things go from there. The Black Yoga Meditative Ensemble want to spread the word. In this case the word is yoga. The project was formed by Yoga guru Kimee Massie and contains no less than sixteen musicians. The music is much darker than your typical ambient background fare. As the press release explains "this is music to create a heavy meditative space" for "people who may not feel they fit into the typical yoga classes". First of all you need to appreciate darkly hued ambient music in order to glean anything from this disc. The soundscapes are sparse yet quite dense with other instruments such as cello and violin augmenting the drone style backdrop of sounds. Effects, synthesizers, keyboards, samples, and programming all help to create a musical backdrop that borders on the macabre. Reviewing the individual tracks would be somewhat pointless as the sound collages bleed into one another. That being said there are subtle differences such as the angular nature of "The Dark Places In Our Lives", the more realized guitar chords in "Carmentis", the heavier guitar feedback in "Negative Confession" or the doom metal riffage in "Lament", probably the disc's heaviest track. The set also includes an instructional DVD that will be beneficial to anyone interested in doing yoga as part of their exercise regimen. Massie is a good instructor, easy to understand and provides an excellent explanation as she goes through the workout. This is an interesting project and I think the artists intention is certainly aimed at helping people by providing an alternative to the traditional way of doing yoga. How much use our readers will get out of this remains to be seen. If you like your ambient music shrouded in darkly lit soundscapes with the occasional diversion into ambient doom metal you may want to give this one a listen. Hey, there are worse ways to discover your inner zen.